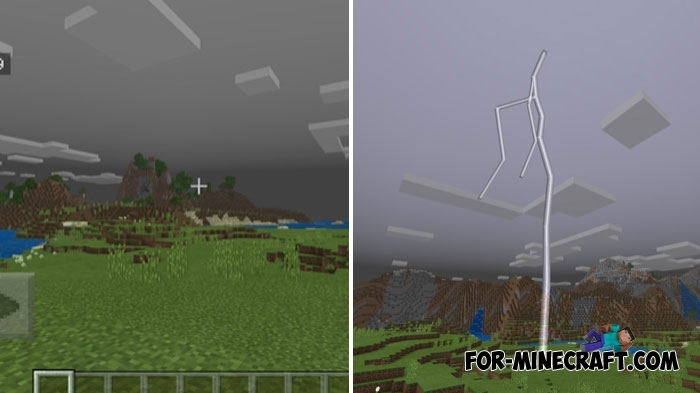 With the help of this wonderful add-on, you can forever forget about the rain in Minecraft Bedrock Edition. As you know, there are different weather conditions in MCPE and if you do not want to see rain, cubic water drops falling from the sky and limiting the visible area, then simply remove it by installing the No Raining addon. Now the sky during the rain will be dark with lightning but without particles of rain drops. This weather condition can be used in different horror maps requiring an appropriate atmosphere without distorting the picture. How to install the No Raining addon?